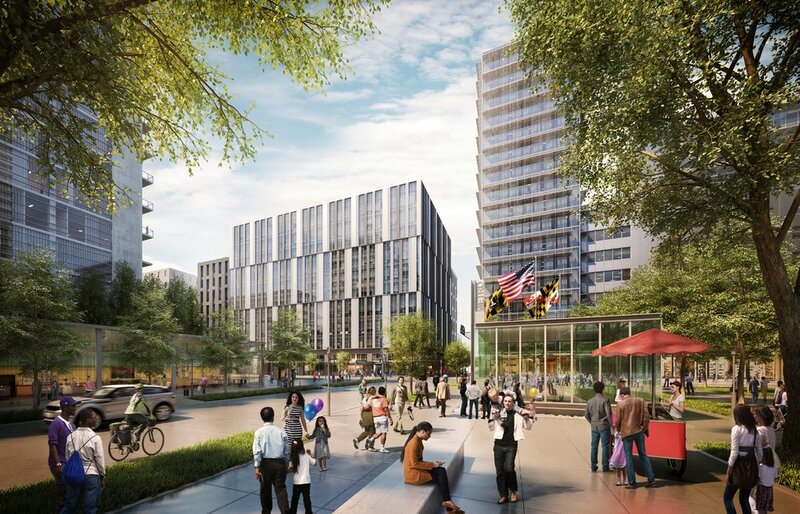 The State Center redevelopment plan would turn a concrete wasteland with the largest concentration of State agencies in Maryland into a thriving, vibrant, 24/7 neighborhood that features efficient state and private offices, residential condominiums and apartments, a grocery store, a school, parking and retail. Listen to the Baltimore Sun's Dan Rodricks and Caroline Moore, CEO of Ekistics, the Baltimore development firm and leader developer of State Center discuss Maryland’s governor, comptroller and treasurer — the state’s Board of Public Works — vote to cancel the $1.5 billion State Center redevelopment plan on mid-town Baltimore’s west side, a project 10 years in the making. Legislation that would require neighborhood participation in any effort to revive a stalled redevelopment project at State Center in midtown Baltimore is advancing in Maryland’s state legislature. Baltimore’s City Council is pressuring state legislators and Gov. Larry Hogan to “protect the participation and planning process” for the nixed redevelopment proposal for the State Center government complex. The Baltimore City Council on Thursday unanimously adopted a resolution urging state lawmakers to spur the redevelopment of State Center under criteria backed by surrounding residents for more than a decade. The master plan for Midtown’s aged State Center complex that the Hogan administration voided in 2016 is still a strong deal for Maryland, the city, state employees and surrounding neighborhoods, a new report commissioned by the developer argues. A new report compiled largely from research performed on the behalf of the state of Maryland shows the proposal to overhaul State Center, according to the developer, isn’t the bad deal opponents of the project have portrayed. Hogan's State Center report leaves one big question: What will happen to the 3,000 people who work there? The study considers the commercial potential for a 28 acre site at the intersection of Howard Street and Martin Luther King Jr. Boulevard as if the buildings were vacant. It doesn’t consider at all the costs and drawbacks of moving the public employees elsewhere, whether it’s to a new building the state constructs or to existing office space somewhere else. And it most certainly does not consider whether, by pledging to keep them there, the state could drastically improve the market conditions and attract investment on a scale that would otherwise be untenable. On Tuesday, during a joint hearing of the House of Delegate’s Appropriations and Economic Matters committees, Caroline Moore, the project’s lead developer, and Michael Edney, a partner at Norton Rose Fulbright, which represents State Center LLC, addressed the study released earlier in the day. Both were critical of it as an attempt to stall development with a proposal that is years away when State Center LLC’s proposal is essentially shovel-ready. They also contended that their experience in dealing with the state shows Hogan’s catch phrase that the state is “open for business” is nothing but an empty slogan. Sign Up Here to Support State Center!